Properties in Saint David's Island average 4.8 out of 5 stars. An historic home in a garden setting 5 minutes from our 17th century town. Property 3: An historic home in a garden setting 5 minutes from our 17th century town. Property 8: *Cozy. Private. Great Location! Walk to everything. Centrally located with easy access to everything! Property 10: Centrally located with easy access to everything! An apartment with best of both worlds, in the center of Town and close to water. Property 24: An apartment with best of both worlds, in the center of Town and close to water. Located directly across the street from Warwick Long Bay Beach! Property 26: Located directly across the street from Warwick Long Bay Beach! 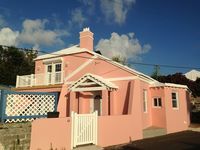 Bright and Airy Bermuda Cottage - Twizy ready! Property 27: Bright and Airy Bermuda Cottage - Twizy ready! Property 31: Beautiful Water Front Property - Snorkel, Fish, or RELAX in the BEST LOCATION! Spacious and new, oceanside, sea view apartments. Property 33: Spacious and new, oceanside, sea view apartments. Property 36: 'Sea Song' Two Bedroom Beachfront Cottage with den right on Marley Beach. Family friendly piece of paradise with fantastic water views! Property 41: Family friendly piece of paradise with fantastic water views! Amazing location with incredible views. Steps from the beach. Great communication from the Mgr, Gordon. Easy access to bus stops. We will be back. 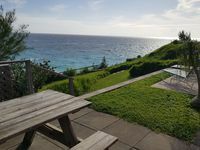 Ponder&rsquo;s End is a wonderful place to stay in Bermuda. We stayed for a week with our three young boys. Away from the hustle and bustle, but close to ferry and bus to get around easily. The cottage has all the necessities (even some games to occupy the kids when it rained) and Naomi, Pat and Sara are wonderful hosts. Highly recommend!